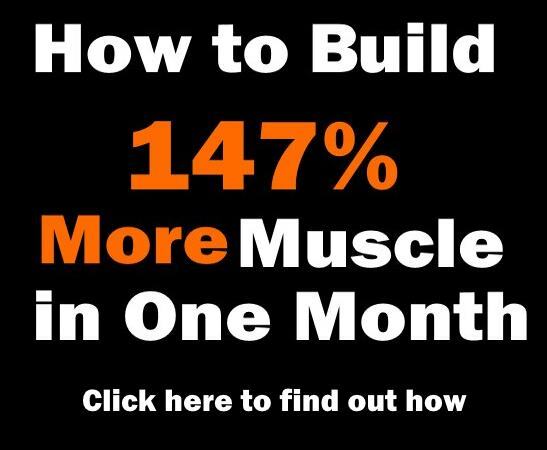 While many lifters are dreaming of sculpting an impressive back back, it seems that most of them are relying on only one or two popular exercises for this goal, and only a few are ready to dial in the work required to build a truly powerful V taper. 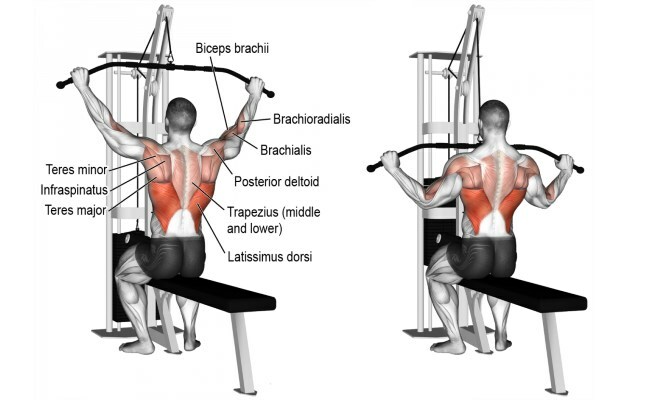 Which brings us to the lat pull-down, a highly effective exercise that primarily targets the latissiums dorsi, the large fan-shaped muscle that makes up a big portion of your back, the lower and middle trapezius, the rhomboids and the serratus, while also engaging the elbow flexors, biceps and brachialis as supporting muscles; and is therefore an invaluable tool when it comes to building your back to bigger and better proportions. In this article we’ll present 5 lat pull-down variations that you should include in your back program for best overall lat development. Aesthetics aside, the benefits of having a strong back are innumerable and range from better posture and improved spine health to injury prevention and overall enhanced physical performance. Having a strong back is also vital for building a strong chest, which means that the more you work on your lat pull-downs, the better prepared you’ll be to go big on the bench press. Since the muscles of the back are the largest in the body, they have huge carryover and strengthening them will allow you to generate more force while also improving stability, resulting in more strength and power. In the very least, neglecting your backside can lead to muscular imbalance, rounded shoulders, neck and shoulder pain and back injury, especially if you’re working the muscles at the front side at the expense of your back. A well-designed back training program should include a variety of moves, such as deadlifts, bent-over rows, pull-ups, lat pull-downs and squats. Sit down on a pull-down machine with a wide bar attached to the top pulley. Grab the bar with the palms facing forward with a medium grip. As you keep both arms extended in front of you holding the bar, bring your torso back around 30 degrees while sticking your chest out. Keep your elbows pointed straight down. By drawing your shoulder blades and your upper arms down and back, bring the bar down until it touches your upper chest. The upper torso should remain stationary all through the movement. Focus on achieving maximum contraction in the final position. Hold for a second, then slowly raise the bar back up. 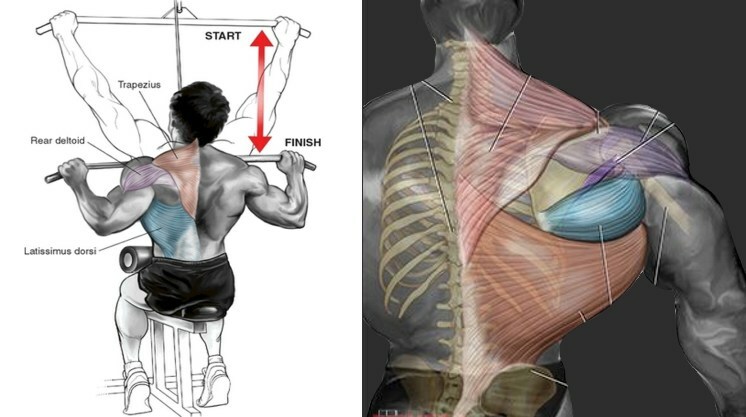 If you’re looking for a way to build attention-grabbing lats, this is the exercise for you. 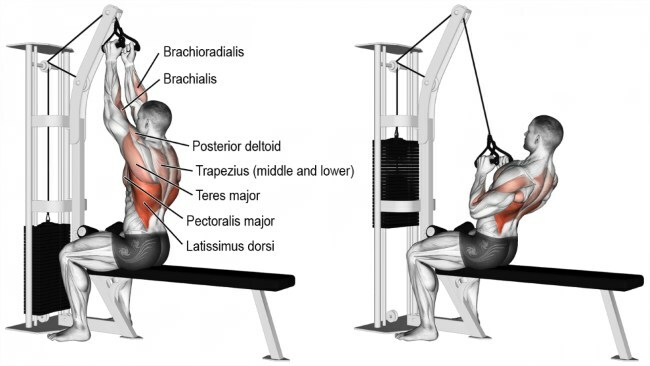 And the best part is that it can be done in many different ways, all of which unlock unique muscular gains, and many lifters believe that alternating between different lat pull-down variations provides their lats with optimal stimulation by hitting the muscles from every possible angle. Want to be the proud owner of a spectacular back? Here are 5 lat pull-down variations that you can’t afford to miss out on! 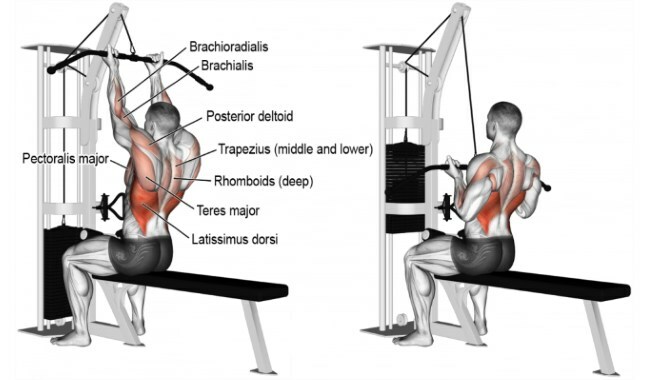 If your primary objective is increasing your back’s width, go for wide-grip lat pull-downs, as they better stimulate the teres major and upper-lat fibers, in addition to working the biceps, forearms, triceps, rotator cuff muscles and posterior deltoids. Still, avoid taking an excessively wide grip as this will reduce the range of motion and increase susceptibility to injury. One of the greatest benefits of this variation is increased pull-up strength. Make sure to squeeze and retract your shoulder blades for maximum muscle activation, and avoid relying on momentum to do your muscle’s work. 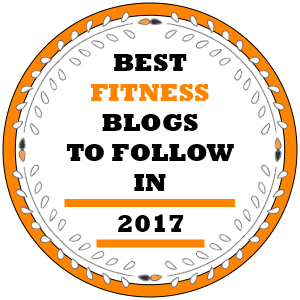 While it’s true that this variant may place undue stress on the shoulders in people with inflexible shoulder girdle, for many others it can be the best back-builder in their routine. The range of motion will allow for a stronger overall contraction and lead to bigger gains, as long as you keep your form in check and start with a lighter weight. 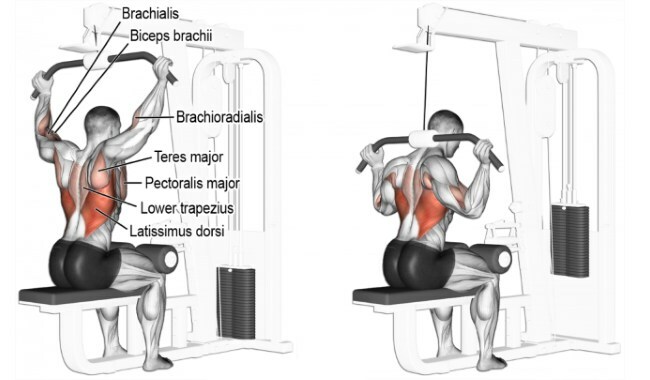 If you don’t have shoulder mobility issues and you’re looking for the lat pull-down that will give you the most bang for your back, this is it. The V-bar pull-down will help you emphasize the center of your back, while still working your lats. Training these muscles will provide support for core movements and improve your stability and performance in all athletic pursuits. 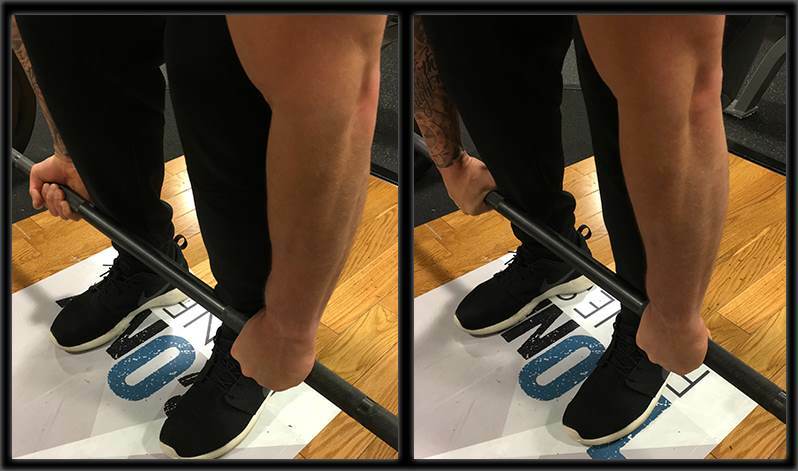 With a secure grip on the V-bar attachment, slowly pull the weight straight down until it’s about even with the middle of your chest, focusing on the contraction of the back muscles. Be sure to lean back a bit more than usual to better engage the lats and complete the full range of motion. Also, strive to achieve a full stretch at the top of the movement. This variant is best for building thick, full lower lats that go all the way down to the waist. Take a close-grip, underhand grip on a lat bar attached to the high pulley of a lat pull-down station, and keep your chest up and lower back arched as you pull the bar down to your chest. Keep in mind that the closer your hands, the more you’ll involve the muscles in the center of your back. Reverse-grip pull-downs stimulate the development of the lats by improving the range of movement in the shoulder joints and scapula, while also increasing shoulder stability by engaging the traps and biceps. Unilateral exercises are tough to beat when it comes to improving mind-muscle connection and maximizing contraction. Try adding a few lighter sets of single-arm lat pull-downs at the end of your workout. Perform every rep in a slow and controlled fashion and hold the bottom position for a few moments before returning back to the top. As you pull the handle down, squeeze your elbows to your side as you flex it. 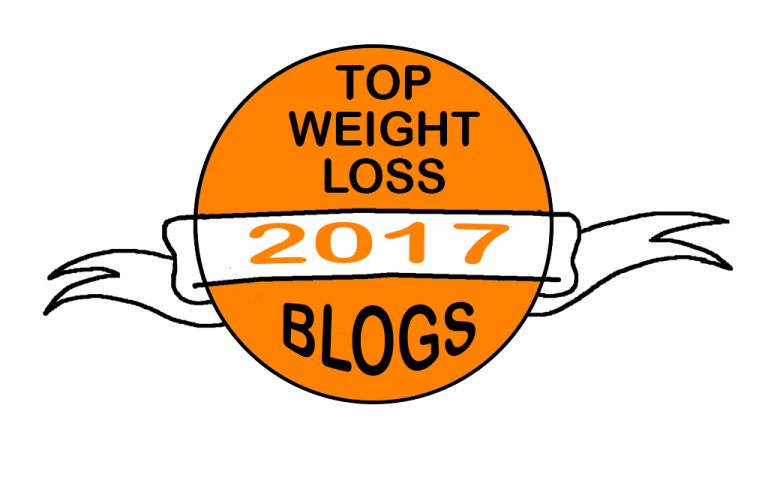 Avoid completely returning the weight in order to keep tension in the working muscles.